At this week’s TREND meeting, we had Chris Strachan come in to discuss his sneaker-based nonprofit, “Kick’n It For a Cause.” A sneakerhead himself, Chris started this organization to ignite conversations that address and impact important social issues. In 2017, Chris raised over 30,000 pairs of sneakers for those in need in the Republic of Congo and Rwanda, helping to prevent deadly diseases spread through their contaminated soil due to the lack of proper footwear. Chris’s love for sneakers inspired us to head to Downtown Tucson to share how we style our favorite pairs. Everyone can vouch for the comfort of any pair of Adidas, but their take on the dad shoe wins my vote for comfort, stability, and style any day of the week. I wanted to match the rest of my outfit to the colorful yet casual look of my Adidas Falcons, which is why I wore an oversized Astroworld tee. Using big tees as a whole outfit is an easy look to attain, it’s comfortable, and still looks like you put in effort. I accessorized with a holographic Rebecca Minkoff purse to play up the color as well. When I think of wearing sneakers, I always associate it with streetwear. The sneakers I chose to wear are a pair of thrifted Nikes with red and blue stars on them. I tried to make my look more vintage since my shoes have that vibe, so I paired my shoes with a cropped red hoodie and black cutoff shorts. I accessorized with plain white high-socks and a red scrunchie to tie the look together and really complete the 80’s/90’s aesthetic. I genuinely do not remember the last time I walked out of the house without a pair of sneakers on my feet. I’m especially fond of a classic white sneaker, which is why I am obsessed with Nike Air Force Ones. The pair I chose to wear are unique because they have the custom Off-White strip on the tongue and on the back of each shoe. I wanted to keep my outfit pretty simple and monochromatic to keep the focus on my shoes, so I wore a pair of gingham pants from Brandy Melville and a black, mesh shirt with a bodysuit underneath. Oversized t-shirts and sneakers are the best combination for a day-to-day casual look, especially on a college campus. It’s easy to throw on and can be styled a variety of ways. Converse are one of the most iconic and well-known pair of sneakers ever created, which is why I chose to wear them with an oversized vintage tee from Kohl’s. Adidas Superstars are a classic sneaker that can be styled so many different ways. I chose to style mine with a pair of blue shorts that complement the blue in the holographic stripes on my shoes. I also wore a ribbed tank top that I thrifted and altered to fit myself. I wanted to keep things bright and fun to match my shoes, but also opted to keep the overall feel of the outfit simple and casual. Kick’n It For a Cause is running a “shoeraiser” campaign at the University of Arizona until the end of November. Students can drop off new/used sneakers in the lobby of Mclelland Park to donate to those in need in Rwanda and the Republic of Congo. 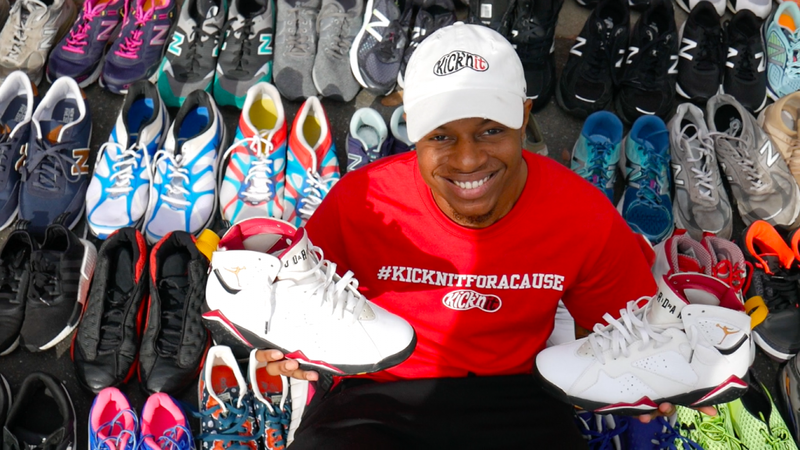 His goal is to raise 100,000 sneakers and $100,000 in 2018. 10% of the proceeds will be provided to underserved communities in the United States.